“There I was” is the traditional start to a war story. It seems like an appropriate way to start this entry, written on the morning of the 8th anniversary of an act of war, the September 11, 2001 terror attacks on New York City’s World Trade Center towers and the Pentagon in Washington, D.C. People everywhere are remembering where they were when they first heard the news; I’m no exception. I was standing at our bathroom mirror, shaving, the portable radio set to NPR, when I heard something about a light aircraft flying into one of the WTC towers, creating what appeared to be a serious fire high up on the building’s side. That got my attention, and I listened for updates as I continued to get ready for work. A few minutes later one of the commentators said that the fire was far too large to have been caused by a light aircraft, and speculated that it might be an act of terrorism. Donna was up by then, and something told us we should migrate to the family room and turn on the television. 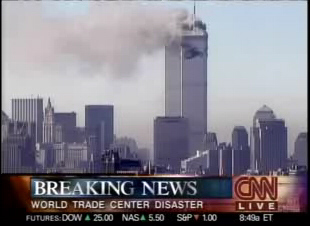 Which we did, just in time to see live video of the second airliner plowing into the south tower. We were glued to CNN for the next half-hour, at which point video of a burning Pentagon flashed onto the screen. I called my boss, who told me they were shutting the base down to all but essential personnel, and that since he and I were just that we should get our asses there pronto. So off I went, breathlessly hanging on every word coming out of the car radio. I was supposed to interview an applicant for a graphic artist position that morning. Since the base was locked down, I interviewed her in the parking lot of the visitor center just outside the main gate. We sat and talked in my car, later moving outside to spread her portfolio samples across the hood (I wound up hiring her). I haven’t been on Facebook yet this morning, but knowing how the Facebook hive mind works, I expect this to be the meme of the day . . . where we were and what we were doing on the morning of 9/11. We all remember, every detail. * The fighter pilot community is a small one, and up to that point in my career fighter pilot rumors had always been dead-on accurate, so I believed the story. It was years before I learned it was false (the rumor originated with an enlisted ANG jet fuel tanker truck driver who saw one of the F-16s that had scrambled that morning landing with no missiles on its wingtips, and assumed the pilot must have fired them . . . actually things were so fucked up that day the F-16s were launched without weapons and couldn’t have done anything anyway, short of ramming UA Flight 93). ** a) In a Sears appliance store in Tampa buying a new refrigerator. A saleswoman screamed out “Oh my god it just blew up!” as it happened live on a store TV, and we all ran out front, where we could see the still-growing fireball in the bright blue morning sky, just 100 miles east of Tampa. b) Mr. Cheney’s drama class at Roseville High School in California. © 2009, Paul Woodford. All rights reserved.